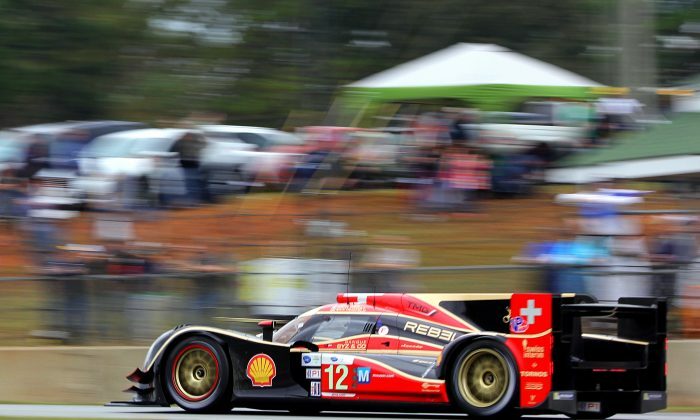 BRASELTON, Ga.—The final American Le Mans Series Petit Le Mans has been a race worthy off the series’ and the event’s history. The weather, cloudy with intermittent light rain, has only improved the action by adding a layer of strategy—when to try to stay out on slicks, when to pit for intermediate or rain tires, when to hope the weather radar is accurate and when to ignore it. With the race half over, there are desperate battles in every class. In P1, defending champion Rebellion Racing finally retook the lead from Muscle Milk Pickett Racing after losing a lap to an early accident. Muscle Milk had been able to preserve its lap lead despite excellent pit work from the Rebellion team, in part thanks to some spirited driving from Klaus Graf after a restart. Five minutes before the five-hour mark, Romain Dumas brought the Muscle Milk HPD into the pits with an ignition problem. Nick Heidfeld in the Rebellion passed the Muscle Milk car in the pits and got back the lost lap—and then took the lead as Muscle Milk’s crew could not find and fix the problem. Halfway through the ten-hour race, Rebellion has a three-lap lead, while the Muscle Milk car sits in the paddock. Muscle Milk driver Lucas Luhr has 49 ALMS wins, and really wanted to end the season and the series with an even fifty wins. However, he can console himself with the thought that he was part of a team which won a record-setting eight of ten races and two consecutive championships. The race went to caution eight minutes past the five-hour mark because of a spinning GTC Porsche—and while the cars circulated slowly on track, Muscle Milk Pickett Racing announced that they had a terminal overheating problem and had to withdraw. This essentially gives the race to Rebellion, who has simply to stay on the track for the rest of the race to repeat as winners. In P2 the #552 Level 5 HPD, driven now by Peter Dumbreck, and the #01 Extreme Speed Motorsports HPD, with Scott Sharp currently at the wheel have been trading the lead. At the halfway point, Sharp leads Dumbreck by 15 seconds. The #551 level 5 HPD was handed a stop+60 penalty after colliding with a GT car, and is two laps down. GTE has been a three-way fight between the pole-sitting #62 Risi Ferrari, the #91 SRT Viper, and the #3 Corvette. Halfway through the race the Corvette is in the lead with Jan Magnussen driving, while Ryan Dalziel is in the Viper and Robin Liddell in the Ferrari. None of those cars lead the class now, though. Nick Tandy in the #17 Falken Tire Porsche currently has a six –second lead over Bill Aubrerlen in the #56 BMW Z4. Liddell in the Risi Ferrari is third. The final American Le Mans Series has been a race worthy off the series’ and the event’s history. With the race half over, and there are desperate battles in every class. In P1, Muscle Milk Pickett Racing has the lead while defending champion Rebellion Racing finally retook the lead after losing a lap to an early accident. In P2 the #552 Level 5 HPD, driven now by Peter Dumbreck, and the #01 Extreme Speed Motorsports HPD, with Scott Sharp currently at the wheel have been trading the lead. At the halfway point, Sharp leads Dumbreck by 15 seconds. None of those cars lead the class now, though. Nick Tandy in the #17 Falken Tire Porsche currently has a six–second lead over Bill Aubrerlen in the #56 BMW Z4. Liddell in the Risi Ferrari is third. Rookie Shawn Rayhall in the #25 8Star PC Oreca leads PC by a lap while points-leading PR1 Mathiesen car sits in the pits after a collision. GTC has also been a back-and-forth battle between the #22 Alex Job Racing Porsche, the #45 Flying lizard Porsche, and the #66 TRG car. At halfway, Nelson Canache Jr. in the #45 Lizard car leads, with Craig Stanton in the #66 second and Cooper MacNeil in the #22 third. The #52 PR1 Mathieson car needs to finish fourth to win the championship—but also needs to finish 70 percent of the race to even be scored.